426 pages | 84 B/W Illus. The Mathematics of Games: An Introduction to Probability takes an inquiry-based approach to teaching the standard material for an introductory probability course. It also discusses different games and ideas that relate to the law of large numbers, as well as some more mathematical topics not typically found in similar books. 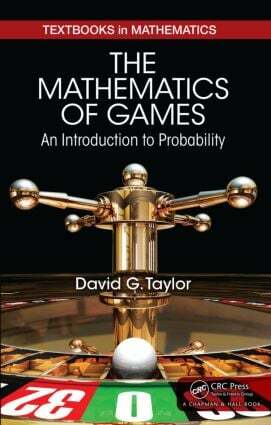 Written in an accessible, student-friendly style, the book uses questions about various games (not just casino games) to motivate the mathematics. The author explains the examples in detail and offers ample exercises for students to practice their skills. Both "mini-excursions" appearing at the end of each chapter and the appendices delve further into interesting topics, including the St. Petersburg paradox, binomial and normal distributions, Fibonacci numbers, and the traveling salesman problem. By exploring games of chance, this text gives students a greater understanding of probability. It helps them develop the intuition necessary to make better, more informed decisions in strategic situations involving risk. It also prepares them to study the world of statistics. Can You Bet and Win? Exercises and Mini-Excursions appear at the end of each chapter. Dr. David G. Taylor is an associate professor and chair of the Mathematics, Computer Science, and Physics (MCSP) Department at Roanoke College in Salem, Virginia.